Wisconsin&apos;s projected budget deficit would shrink by $700 million, under legislation signed by Governor Jim Doyle Thursday. The economic recovery bill enacts an assessment on hospital services, funds worker training programs, and authorizes $300 million in transportation spending from federal stimulus money. Doyle says the bill lays critical groundwork for getting Wisconsin&apos;s economy back on track. 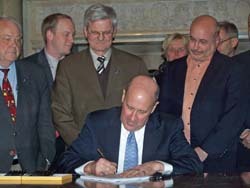 The bill was signed just four days after it was introduced. Doyle says such quick action was warranted so the state can take advantage of available federal funding. The legislation passed the Assembly and Senate Wednesday with no Republican support. Doyle says GOP lawmakers just tried to make the debate as partisan as they could.